Four Fijian-New Zealand and Australian-based women artists will meet in Suva, Fiji next week for a creative research project inspired by the practice of Fijian female tattooing. This is the first time a research project is being undertaken to delve into the lost tradition of Fijian female tattooing of veiqia. 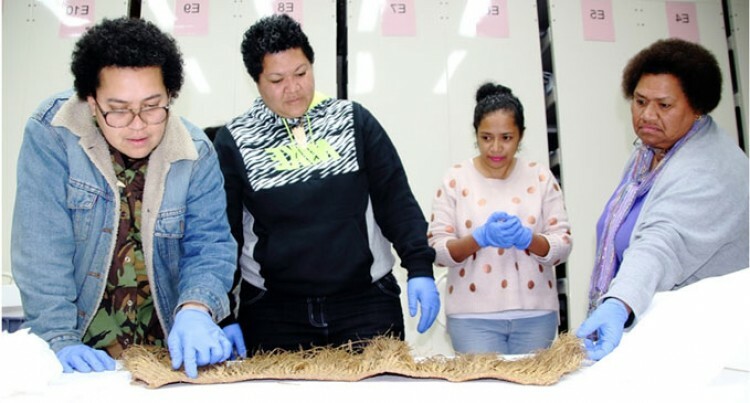 The Veiqia Project has gathered seven contemporary Fijian women artists engaged in Australia and New Zealand to participate in shared research activities and museum visits. At its heart, the Veiqia Project involves nine Fijian women, seven artists and two curators, on a journey of artistic and cultural enquiry. Four of the seven artists are in Suva to undertake research, meetings and participate in events. New Zealand-based artists Margaret Aull, Joana Monolagi and Luisa Tora will join Australian- based Dulcie Stewart for the exhibition. The project has drawn significant support from Auckland Museum, Fiji Museum, the Fijian Art Project, practitioners, supporters, friends and family engaged both on and offline. “Fijian women used to have a very proud ancient tradition of veiqia, where girl children were tattooed when they reached puberty. This tradition has been lost over time due to colonisation and other factors. “We are grateful to Creative New Zealand for significant funding towards this research,” Ms Tavola said. The artists will hold an Open Day tomorrow at the Fiji Museum veranda which will include visitations to artists at Tagimoucia Gallery, Fiji Corrections Unit, Suva, and dialogue with Fijian tattooist Billy Blaze.